Though it was eagerly awaited by everyone in the financial inclusion space, the World Bank’s 2017 Global Findex report has prompted some earnest reflection about the progress of financial inclusion. As we noted soon after the report’s release, there are signs that financial inclusion is slowing down in many places. Actual banking services, such as credit and savings, are not really growing in the wake of digital payments, which are driving inclusion in certain markets, particularly in Africa. Based on the report’s findings, it seems clear that universal financial access by 2020 is unlikely. This glass-half-empty viewpoint is vividly illustrated by Elizabeth Rhyne and Sonja Kelly in their recent publication, Financial Inclusion Hype vs. Reality: Deconstructing the 2017 Findex Results, which was amplified in an article on NextBillion. Among the tough questions prompted by the report is the question of how regulated microfinance institutions should respond to the emergence of mobile money. FINCA, together with many of our peers, has been working-through the role of digital payment channels and their implications for our clients and the future of our work. Bluntly stated, we have asked whether digital payments and fintechs are gradually making regulated financial service providers irrelevant. 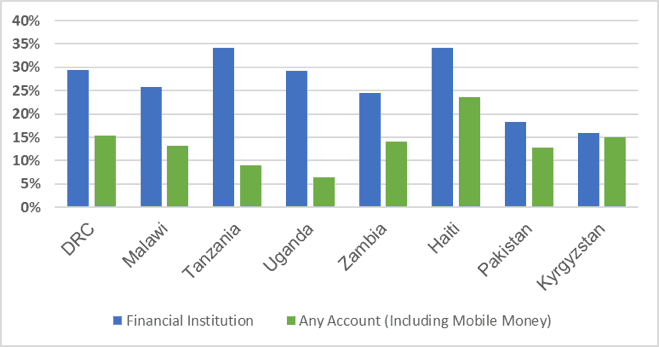 Looking at Findex data on ownership and usage between financial institution and mobile money accounts, however, a more nuanced picture emerges. Amidst the very mixed signals that it sends about financial inclusion overall, the latest Findex also contains data that shows it is far too early to dismiss banks as dinosaurs that will be wiped out by mobile banking. There certainly are a few countries in Africa where mobile money is gaining as an independent service outside of the banking system. But for the most part, regulated financial institutions still play a defining role—not only as banks, but also as providers of these digital services. We can start by looking at the types of accounts that people own. The Findex distinguishes between all accounts (including those associated with a mobile money service) and accounts at a financial institution. Comparing these two figures gives us a rough idea about the overlap between financial institutions and mobile money. 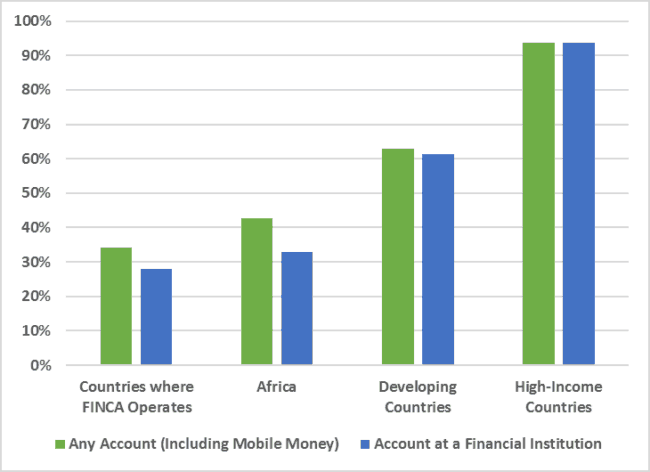 In high-income countries, there is no difference between the share of adults who have any kind of account (including a mobile money service) and those who have an account at a financial institution. 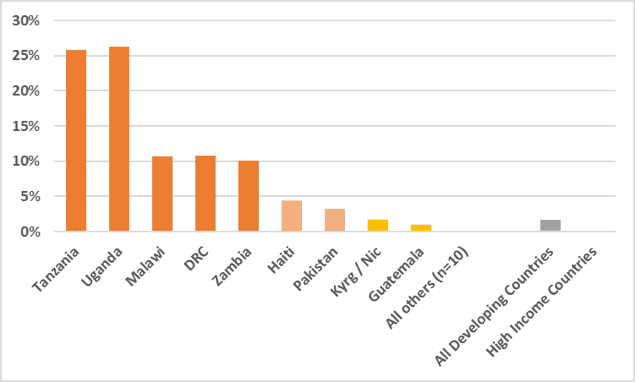 There is a difference in developing countries overall, but it is very small. 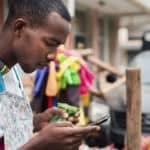 The situation in Africa is unique: there is a 10-point gap between the 41 percent of adults who have any kind of account (including mobile money) and the 31 percent who are clients of a financial institution. This hardly means that financial institutions are out of the picture. In fact, three out of four account holders are clients of a financial institution, while the remaining one has an account with some other kind of provider—most likely a mobile money service. The real story, however, is local. Here the role of banks is even more evident. 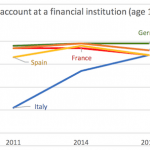 The graph below shows the country-level breakdown for FINCA, focusing only on adults who have an account outside a financial institution. Unsurprisingly, the African countries are all clustered at the top, with two huge stand-outs: Tanzania and Uganda. 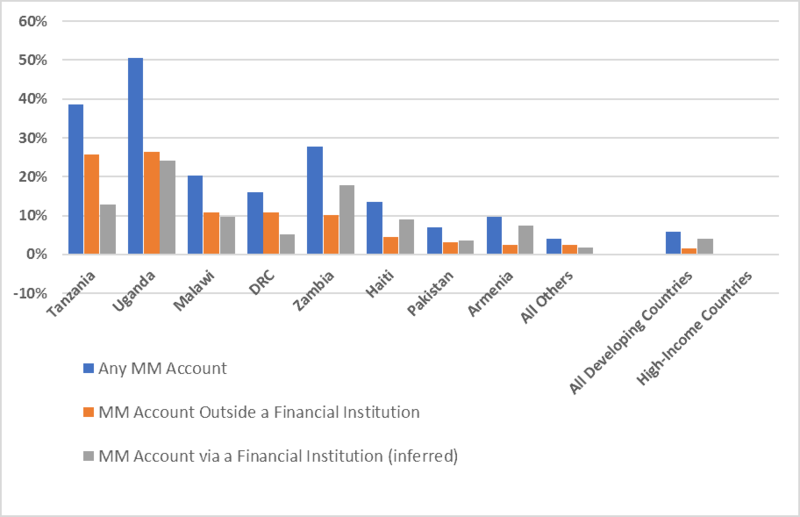 Outside of Africa, however, Haiti and Pakistan are the only FINCA countries where more than 2 percent of adults have a non-financial institution account – out of the 20 countries across five continents where FINCA operates. Several factors could explain why non-bank financial services are not as widespread outside of Africa. In many places, local banking laws still restrict mobile money to regulated financial institutions. In others, the business model and use cases for non-bank mobile money may not yet be compelling enough to gain scale. Change can come fast, of course. But when we talk about digital financial inclusion today, it isn’t all about M-Pesa and fintechs. Financial institutions still have an important role to play. Whether they will continue to do so in the future depends on how the regulatory environments evolve with respect to non-bank service providers and further technological change—in areas like credit scoring and blockchain, for example. More importantly, it also depends on whether banks can leverage their core competency in financial intermediation to design products that add more value than payment services alone, by driving use cases that tangibly improve their clients’ financial wellbeing. Across the global FINCA network, Tanzania, Uganda, Malawi and the Democratic Republic of Congo are the only countries where mobile money is mainly being conducted by people who do not have a financial institution account. More commonly, mobile money customers are a subset of banking customers. The task of financial inclusion is not complete once people have access to an account; in fact, that might not even be the hardest part. The real challenge is to create services that people actually use. The best evidence of success is an account with a healthy volume of activity, and the latest Findex data shows that mobile services can help achieve that. The chart below compares the percentage of accounts that are dormant (no activity in the last year) for financial institution accounts versus all accounts, including mobile money. The category that includes mobile money (green) clearly has a huge advantage, especially in the five African countries. The difference in account activity is especially striking in Tanzania, where over a third of bank accounts are inactive, while less than 10 percent of all accounts (including mobile) are dormant. Since many of these mobile money accounts are new, it is likely that at least some of this activity relates to the initial deposit of funds, and there is no guarantee that the account will not fall dormant later. But from the data so far, mobile accounts are showing less dormancy than traditional accounts. What does this tell us? For one thing, the usage drivers for regular bank services and mobile services are clearly very different, at least in these eight markets. In a recent set of focus groups in Pakistan and Kyrgyzstan, FINCA heard firsthand from clients that the use cases for mobile banking are still very formative, because most people are just gaining familiarity with the services. Even so, it appears that mobile banking is a much more engaging form of service for customers, as evidenced by the comparatively high rate of activity. Here is an opportunity for financial institutions: Create and deliver tangible use-cases for mobile services, and account dormancy will fall. The latest Findex shows that both financial institution and mobile money accounts have vital roles to play in achieving universal financial access. Going forward, microfinance institutions and banks should be focused on digitizing their services to reduce costs, improve efficiencies and extend reach. They should also be using mobile money as a way to engage customers and to develop use-cases that add value beyond payment services. By integrating digital finance tools in truly impactful ways, these traditional institutions can remain relevant drivers towards meaningful financial inclusion. Scott Graham is the director of Customer Research and Field Data Services for FINCA International. Photo credit: Doug Kaye via Flickr.